The Bicycling Survey is now closed for responses as of July 31,2018. Stay tuned for results and to hear if you’re the winner of the awesome prize shown in the photo below. The winner will be notified via email. 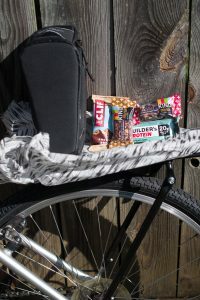 The prize is a Blackburn bicycling bag that attaches to a bike + a bunch of Kind granola bars and Cliff bars, shown in the photo below!